Brody Belt netted 53 yards on 13 carries. Cornhusker fans are knowledgeable, and when the stakes are high, they are as intense as any in college football. But spring football is not one of those times. Spring football in Nebraska is a family reunion, a glorious picnic. It’s the time to see who the new sons, grandsons, nephews look like and what they can do. It’s the time for meeting old friends in a stress-free gathering, without the highs and lows of a game in the fall. We watch the players closely. We analyze trends, chart the growth of top recruits, root for home-state boys to make good and predict starters two years out. I already know Adrian Martinez is the type of mature, capable and emotionally stable young man I hope marries my granddaughter someday. You probably do, too. While all this is true, it’s often a day to be dissatisfied, no matter what. Husker fans watch for third-team running backs to make a splash. They rooted for sophomore Jaylin Bradley as he broke a couple of big first-half runs, yet fretted that the first-line Red team defense didn’t shut him down. They rooted for Beatrice redshirt freshman Cam Jurgens at center, and saw A.J. Forbes, another redshirt freshman Nebraska native from Bellevue West, get just about the same amount of snaps, sharing time at center and right guard. They hope for depth in the offensive line, yet at disappointed that nobody clearly stands out. They swelled with pride when ex-Huskers who play in the NFL were introduced. Rex Burkhead, who soon will be fitted for a Super Bowl ring, got even more cheers than Fred Hoiberg, the new basketball coach. They saw a lower-scoring spring game than we’ve seen lately, which I suppose makes sense, considering all we heard about the defense looking better than the offense in practice the past few weeks. They saw Martinez — protected from contact by his green jersey — play for just a little over one quarter and account for a pair of touchdowns. They saw late-blooming senior outside linebacker Alex Davis get two sacks and an interception, although the pick was nullified when officials ruled quarterback Andrew Bunch had been touch-sacked before he threw the pass. They saw freshman quarterback Luke McCaffrey and freshman tight end Katerian LeGrone, who likely will combine for a few touchdowns in 2021, flash some athletic promise. They saw a 55-yard touchdown reception by Wyatt Liewer, a 6-foot-3 redshirt freshman from O’Neill who once made a highlight-reel one-handed catch to help his team beat David City Aquinas in the 2016 Class C1 state quarterfinals. Mostly, they sighed with relief when the first-team players left the game without any apparent serious injuries. It was a day for families. Young children got their first Memorial Stadium hot dog, while their older brothers and sisters explained why people were releasing thousands of red balloons. Fathers reunited with long-grown sons who live halfway across the country. In the press box, I thought of the late Don “Fox” Bryant, the longtime Sports Information director, who worked to spread the Husker football gospel throughout the Devaney-Osborne era until his retirement in 1997. Then I saw his son, Bill Bryant, who supervises the press box and keeps media members apprised of play-by-play and down-and-distance over the interior public address system. Bill was taking a photo of his own son and nephew in front of the iconic red plaid blazer the Fox usually wore on game day, which is framed and enshrined on the wall of the media lunch area. It was a day for the Husker family, which is growing both wider and closer. Michael Booker was back in the house Saturday. Booker was a starter at defensive back on the 1995 national champions (remember his pick-six against Florida in the Fiesta Bowl?) and returned for his senior year while Scott Frost quarterbacked the Huskers as a junior. In the tunnel immediately after the game, Booker greeted a surprised Frost, who embraced him with a smile. Frost referred to Booker in his postgame press conference, and talked about the ever-expanding Nebraska football family. “I’ve seen some guys that I haven’t seen in two decades,” Frost said. “I saw Erick Strickland yesterday. I haven’t seen him in years. Guys that it’s special for me to see because they are a part of this brotherhood. I love having those guys back. One, I care about them, and they care about me. I also like to see those guys back and see what it means to be a Husker football player and see how it goes with you your whole life and see how the fans still know who you are. One very important addition to the family came hours after the game ended, in the form of a commitment by Turner Corcoran of Lawrence, Kansas, one of the most sought-after offensive linemen in the Class of 2020. 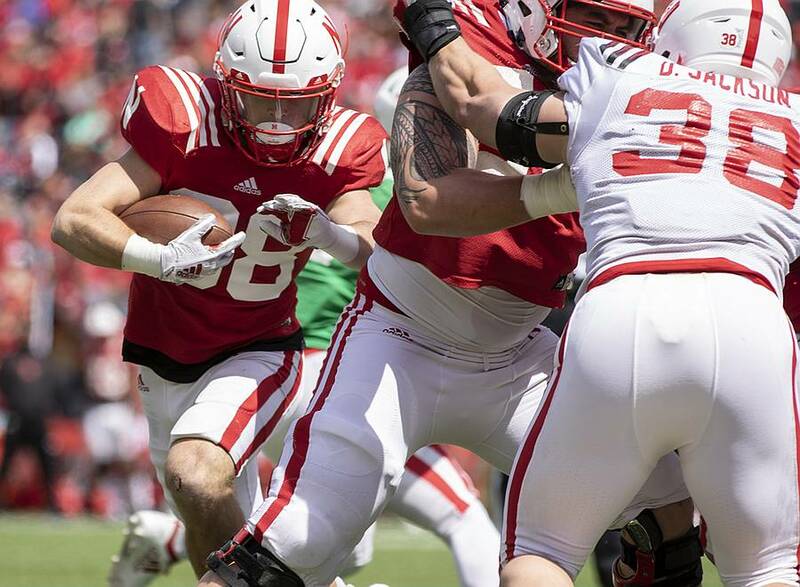 “I was born to play for the Huskers,” Corcoran said in a tweet Saturday evening. He will be welcomed and fussed over until he signs a letter of intent, then fussed over some more. So will dozens of other prospects being pursued by Frost and his staff, who proved again Saturday that they can win the offseason every bit as well as Mike Riley and his staff used to. But aside from the family feel-good stuff, the offseason doesn’t count for much. Riley never quite understood that. Frost does. So do Nebraska fans, who will be back in 20 weeks to turn up the intensity a few notches.